Hot off the press from Al Reuters comes another heart-rending story from Lebanon, detailing how the genocidal Israelis are once again deliberately targeting innocent civilians with their air strikes. From the story, written by Hussein Saad, we learn that an Israeli jet killed two people with a missile close to a United Nations aid convoy. To lend veracity to his story, Saad calls in aid Robin Lodge, spokesman for the UN's World Food Programme. "A vehicle was hit some 15 km (9 miles) north of Tyre as it was travelling a few metres ahead of our convoy," he is cited as saying, "It was carrying bread. It was civilians... This has come as a shock and underlines just how dangerous it is right now." We are not told whether Lodge was actually at the scene but he is probably with the UN convoy. His citation continues, with him saying that the convoy stopped but did not offer first aid "because local officials were quickly at the scene". We are also told that an un-named "witness at the hospital" saw the bodies of the two who died in the attack. That is the "factual" core of the report, which is then padded out with other material. The incident has also been fully recorded by at least three photographers, who just happened to be at or near the scene, even though we are told, in careful detail, how difficult it is in moving on the roads of southern Lebanon. 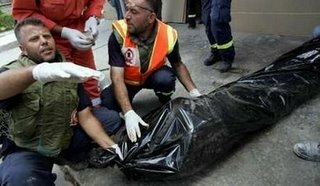 Emergency workers rush to remove the lifeless body of a victim of an Israeli missile strike in Tyre, southern Lebanon, Sunday, Aug. 6, 2006. Israel continued its bombardment of Tyre and surrounding areas Sunday and its assault on southern Lebanon. A Lebanese rescue worker talks to his colleagues next to the body of Ali Reda Ghabun, who was killed in an Israeli air strike, at the government hospital in the southern port city of Tyre (Soure) August 6, 2006. 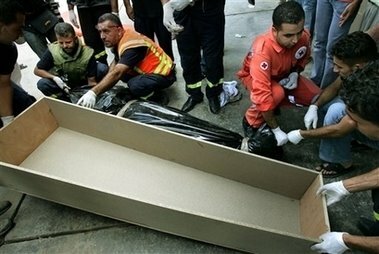 Medics prepare to load the body of a Lebanese man killed in an Israeli missile strike, into a coffin after arriving at the hospital in the port city of Tyre, southern Lebanon, Sunday, Aug. 6, 2006. The man was driving a van full of bread from the city of Sidon north of Tyre when the missile was fired on the vehicle, sources said. Now, from the "on-the-spot" reporting, by four separate journalists, there can be no doubt that this is another "innocent victim" of an Israeli bombing raid. But, let us play devil's advocate. If we take the journalistic sources as tainted, the only independent witness cited is Robin Lodge, who says the UN did not offer first aid "because local officials were quickly at the scene". You bet they were. One might suggest, with a healthy dose of cynicism, that this was rather convenient. That means no independent witness gets to look inside the van "full of bread". Furthermore, we have so far been offered no photographs of this van, exterior or interior. We only get to see one "victim". And, as for the "local officials" so quickly on the scene, one could very well be none other than Mr "Green Helmet", Hezbolla scene manager (the "cleaner"? ), to make sure the right things are said and done. He is visible in all four scenes. Lets us add some more factors. Point one: all Hezbolla "fighters" are prosecuting this war in civilian clothing. Point two: Hezbolla use civilian vehicles (and even ambulances) to transport their Katyusha missiles and other war materiel. 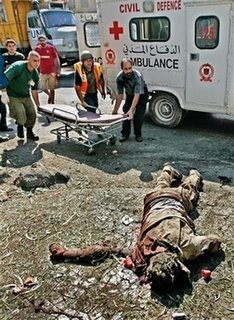 The scenes show the body of a Hezbolla terrorist in civilian clothing, guarded by a Hezbolla "minder" posing as a civil defence worker. 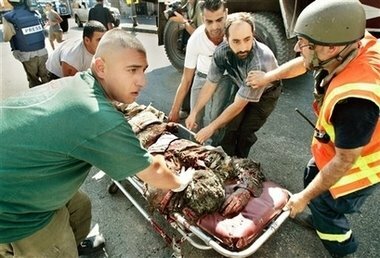 The terrorist was caught by an Israeli precision air strike while transporting war material in a civilian vehicle disguised as a bread delivery van. He was one of two in the vehicle who was killed and, although the strike was only "metres" away from a UN convoy, no one else was hurt. As I said, this is pure invention. Without a detailed investigation and independent verification, we could not even begin to assert that it was true. We must, therefore, rely on the good faith of Messrs Hussein Saad, Ben Curtis, Zohra Bensemra and Kevin Frayer, who have unimpeachable credentials as impartial reporters. We have every confidence that they are telling the truth, the whole truth and nothing but the truth.